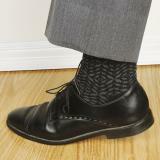 An everyday Merino wool sock. 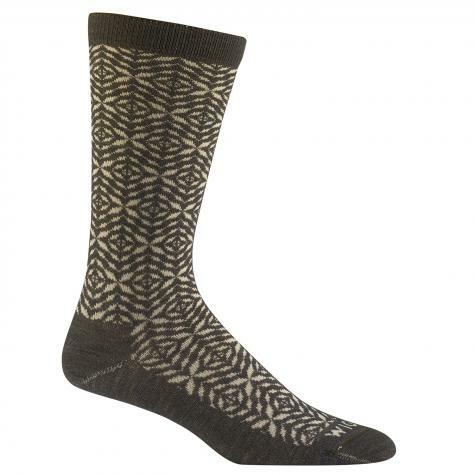 Features tik patterning and unbelievable comfort. Ultra-lightweight. 1905: Out of the ashes of the old Sheboygan Knitting Company grew the Hand Knit Hosiery Company—known today as Wigwam Mills. The new company began producing wool socks and headwear for local residents and nearby lumbermen. Destined to become an American icon, as the company grew Wigwam proudly waved a pennant of quality and comfort. 110 years later that pennant still waves, and Wigwam continues to thrive as a family owned business in Sheboygan, Wisconsin. 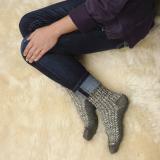 Their socks are still knitted exclusively in the USA, and 85% of their raw materials are sourced from US producers. They support yarn spinners and wool farmers across the USA, working closely with them to produce top quality natural fibers. The 21st century has brought changes to Wigwam. Notably, their manufacturing facility is now state of the art and getting more "green" all of the time. They’ve taken great strides to work with local utility companies to improve efficiency and limit their carbon footprint. They’ve accomplished this by installing solar energy panels to heat water, motion sensory lights to limit wasted power, and responsible waste management to re-use and recycle as much as they can. From function to fashion, battlefields to cornfields, playgrounds to professional arenas, Wigwam has become a leader in the American textile industry. In 1905 they set for themselves a high standard of honesty and integrity—a standard that they strive to live up to every day.